detected by drawing isothachs (the lines connecting points of equal wind speed) on a weather map. Jet streams form in the upper troposphere , between 6.2–8.7 mi (10–14 km) high, at breaks in the tropopause, where the tropopause changes height dramatically. 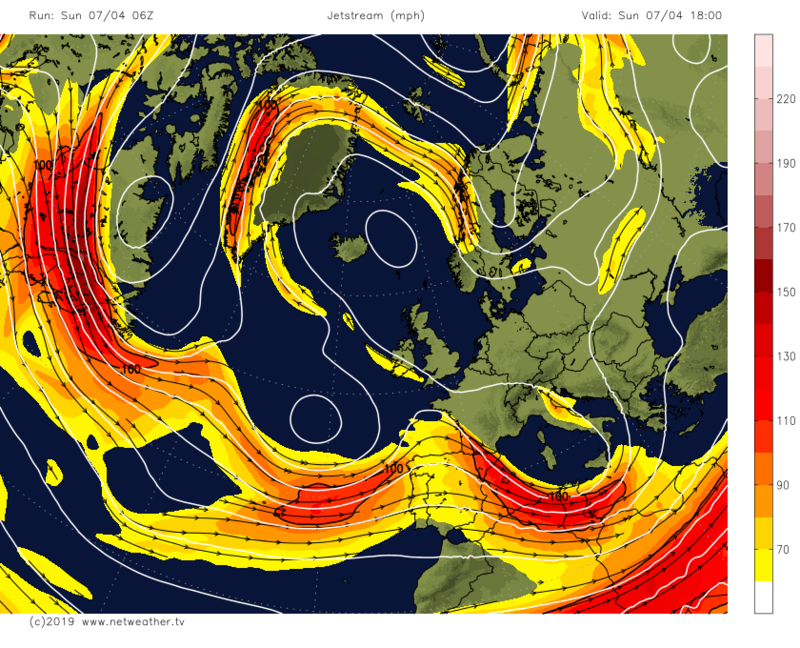 Jet streams are located at the boundaries of warm and cold air, above areas with strong temperature gradients. For example, the polar front, which separates cold polar air from warmer subtropical air, has a great temperature contrast along the frontal zone, leading to a steep pressure gradient. The resulting wind is the polar jet stream at about 6.2 mi (10 km) high, reaching maximum wind speed in winter. Sometimes the polar jet can split into two jets, or merge with the subtropical jet, which is located at about 8 mi (13 km) high, around 30 degrees latitude . A low-level jet stream also exists above the Central Plains of the United States, causing nighttime thunderstorm formation in the summertime. Over the subtropics, there is the tropical easterly jet, at the base of the tropopause in summertime, about 15 degrees latitude over continental regions. Near the top of the stratosphere exists the stratospheric polar jet during the polar winter. Jet streams are well known since World War II. Detailed knowledge about the jet stream's location, altitude, and strength is essential not only for safe and efficient routing of aircrafts, but also for weather forecasting .